This afternoon we continue our trek through the state of Michigan as we get you ready for the Big Ten basketball season. The shadow from East Lansing to Ann Arbor has continued to shrink over the last few seasons as Wolverine head coach John Beilein develops the Michigan program into a respectable foe. Last year, it started rough for the Maize and Blue, but after a tournament berth and the season sweep of the rival Spartans, things are looking bright for the ‘little brother’ of college basketball. Watch Out B1G, Here Comes Tim Hardaway Jr.
Last year’s team didn’t have any seniors, but gone is leading scorer and distributor Darius Morris, who declared early for the NBA Draft and was selected by his hometown L.A. Lakers with the 41st overall pick. If this team can respond to losing their heart and soul on offense, then should be a favorite to finish near the top of the Big Ten Standings. The way the season finished for the Wolverines, it’s hard to imagine that they went 1-6 to start the Big Ten campaign and at times could not find a rhythm on the court. After a big upset of Michigan State at the Breslin, the Wolverines got on a roll and ended up winning 10 of their last 14 ballgames. With the hot streak, the Wolverines went dancing for the second straight season. As a no. 8 seed entering the tournament, the Wolverines opened up with a tough no.9 seeded Tennessee team. At the end of the day, Michigan played their best game of the season, winning by 30 (75-45) — the biggest margin in tournament history in the 8/9 match up. Up by four at the half, Darius Morris and company came out on a 19-2 run and literally became the dagger that ended the violation filled era of Volunteer basketball under Bruce Pearl. The most impressive factor in the game was Tennessee’s obvious advantage of strength, athletic ability, and interior play. Yet Michigan scored twice as many players in the paint, out rebounded the Volunteers by ten, an dominated on defense by holding them scoreless for 5 + minutes twice in the second half. In game number two of the NCAA tournament against the Duke Blue Devils, the Wolverines looked over matched. With just less than 7:00 left in the game, they were down 12. It what was the greatest display of character, fight and heart of last year’s tournament. Down throughout most of the game, Michigan weathered the Blue Devil storm late, as Tim Hardaway Jr. scored seven unanswered to close the gap to one with 1:30 remaining in the game. With :9 seconds left on the clock, Duke’s Nolan Smith missed his second free throw to keep it a 2 point game (73-71). The basketball was rebounded by Michigan’s Zach Novak and kicked out to Darius Morris who drove the floor and put up a floater from the free throw line with 3 seconds left that clanked off the back iron. The Wolverines didn’t quite make it to the Sweet Sixteen, but they ended the season with a bang. An all-around effort that grounded the foundation for a building program and solidified their identity heading into this season. Like ‘em or hate ‘em, The Michigan Wolverines will be a top tier team in the Big Ten this season. 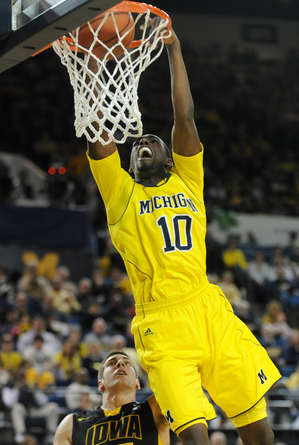 Tags: 2011 Basketball Preview, Darius Morris, John Beilein, Jordan Morgan, Michigan Wolverines, Tim Hardaway Jr. They need to skim the pond at the B1G Tourney. There’s some scUM on it.